Tuesday June 17th 1884. I was at home all day, and busy with the work most of the day Julia does not help us any more. John Helmick was here for dinner and to stay all night. Kate Wonger and her husband with John and Hatt were here to spend the evening. The law students graduated today. Will Mc went up to Dubuque for a few days. Wednesday June 18th 1884 I went over town with Rob in the phaeton and got things for dinner. The folks all went to commencement and the girls went home in the afternoon. It rained quite hard. I got a case of berries and put in the afternoon putting them up Mr Gilliland went home tonight. Thursday June 19th 1884 We had the washing done today and I got part of the ironing done too Weather very warm Mr Hysham started home today. 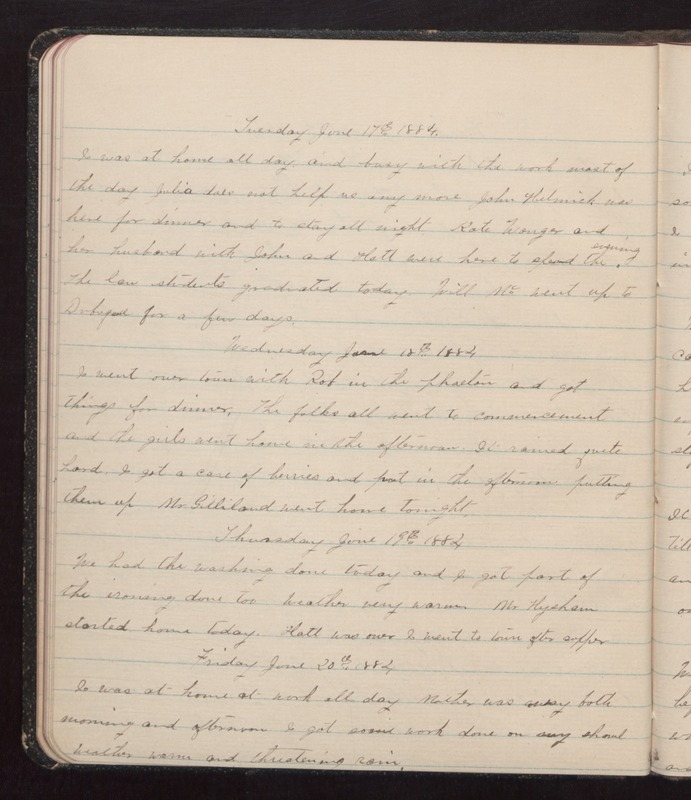 Hatt was over I went to town after supper Friday June 20th 1884 I was at home at work all day Mother was away both morning and afternoon I got some work done on my shawl Weather war and threatening rain.